What we don’t know about Stanley Milgram. Most people recognize Milgram by his research on the obedience. This review attempts to highlight Milgram research on topics except small-world and obedience experiments. The review is based on the book “The man who shocked the world” by Thomas Blass. Followed by the work of his advisor Asch on Conformity, Milgram conducted social conformity setting in another setting in Norway. The subjects were asked to answer some questions where they were told that there are other subjects in the experiments (bogus). 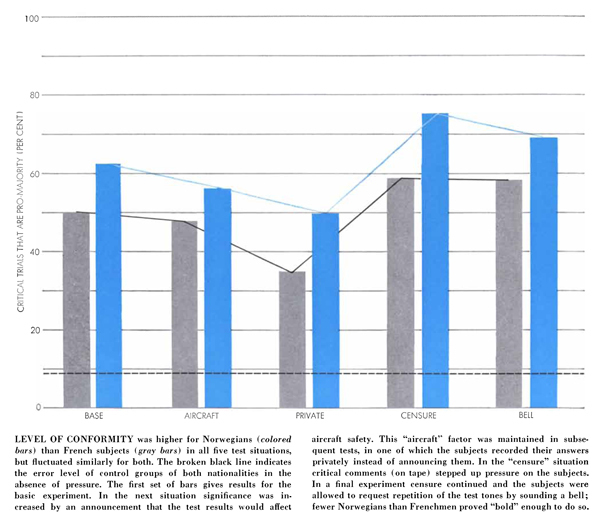 Illustration 1: level of conformity in each sets of experiments. The blue color shows Norwegian subjects and the gray color shows French subjects. The subjects, follow bogus majority about 62% of the time. However, if the answer have serious consequences, the conformity dropped to 50 % (aircraft condition). In private condition, where subjects write down the answer instead of announcing it, the level of conformity was 50 %. In bell condition, the subjects could ring bell and ask for repetition of the words. That leads to 69% conformity. In Censure condition, the confederates, gave contradicted opinion right after the subject respond and that jumped the conformity to 75%. Milgram repeated the experiment with Norwegian from different social classes and there was no statistically significant differences. Milgram repeated the experiment in France. What he discovered is that social conformity in general was lower among Parisian than Norwegians. In another example, Milgram showed that people can behave differently within a group than as an individuals. The subjects increased the level of shock as a learner gave incorrect answer (like in obedience setting). However, the subjects either act in group – where the other two confederates called for on-step shock increase each time the learner made mistake – or they act individually. Illustration 2: The subjects increase the level of shock as a result of being in group pressure. Milgram not only examined six degree of separation, but he also experimented the diversification of the subject of the targeted letter and the subject who send the mail. 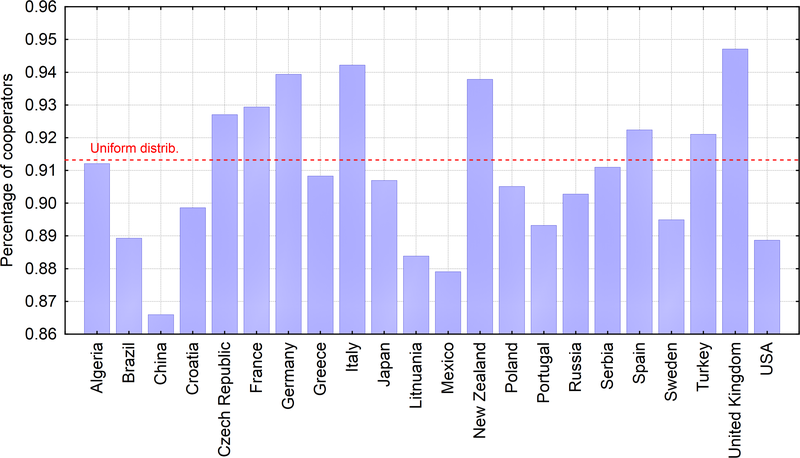 The technique also used to predict elections in one county. More letter had been mailed from either party, could determine what party people are voting for. In terms of ethnicity, they also found differences between black and white subjects. His research on distributing letters addressed to pro-Peking and pro-Taiwan, was unfinished. 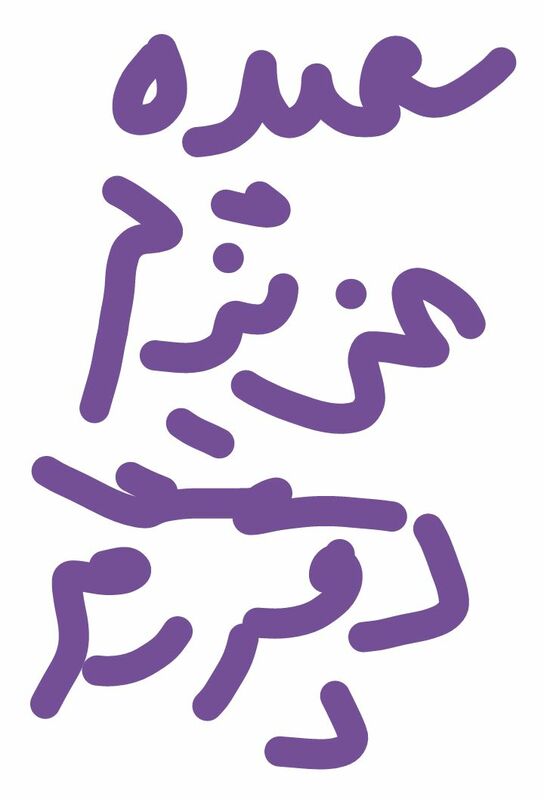 Illustration 3: results of lost-letter technique. Depends on the location of the letter and the address, the number of letters that had been returned varied. Help stranger – Milgram conducted various experiments to explain behavioural differences between urban and rural residents. He introduced an idea of overload – in which a system holds more input than it can be understood. In such experiments, he addressed the readiness to help stranger. People went house to house and asked if they can use the telephone for emergency calling. What he found was that people in cities were less helpful than the small town residents. 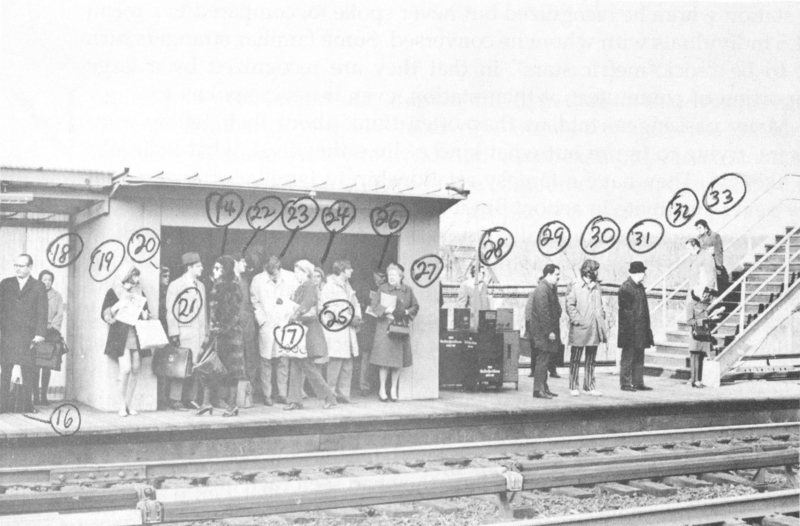 In another experiments, with his students, they conducted series of experiments in the New York subways. The students asked the passengers to give their seats to them. They wanted to know in what extend people are willing to give their seat to a stranger. Mental maps – How the objective geographical layout of a city was represented subjectively in the minds of its residents. He explained “… people make many important decisions based on their conception of a city, rather than the reality of it. …”. E.g. the Parisians were asked to draw the map of Paris. Milgram recognized certain order of entering a place in the map. That Shows the importance and the history of the city. The mental map of the city show how the city sits in the mind of its residence. Vertical city versus flat city – How does living in skyscraper modify thinking and behavior? 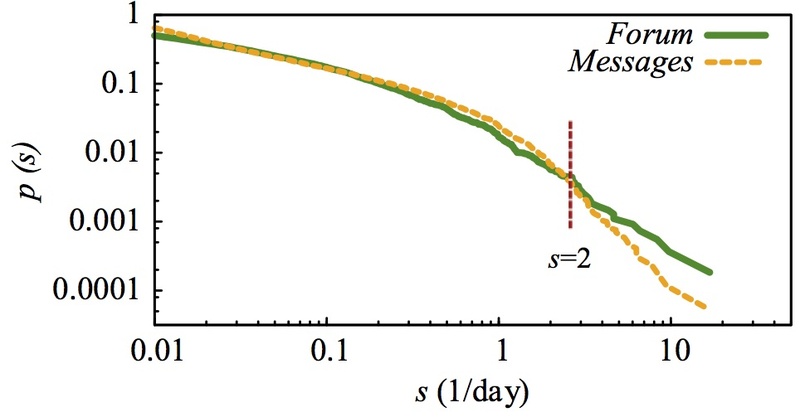 What effect does the vertical life have on human relationship? Familiar stranger – The students gave a photo of crowds standing in the subway to the passengers and ask the subjects to recognize the people in the photo. 89% of the people recognized at least one familiar stranger. On average, they reported seeing 4 familiar stranger. 47% of people were curious about the familiar stranger. Illustration 5: The familiar stranger experiments. The people in the experiments were asked to name which passengers they can recognize from the photo. 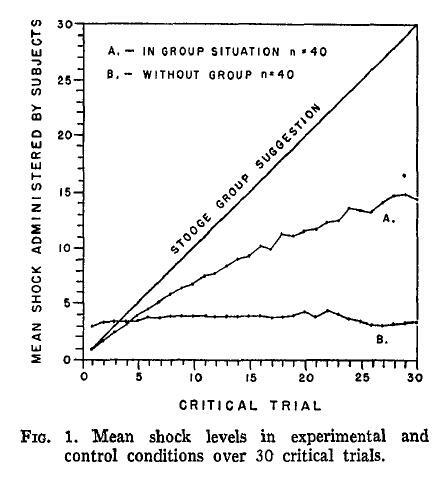 Milgram designed an experiments to test the social contagion. Up to 15 stimulus crowds, gathered in a busy street in New York looking up to the sky. They realized, as the number of stimulus increase from 1 to 15, more passerby gaze up to the sky. Illustration 6: Power of the crowd experiment. 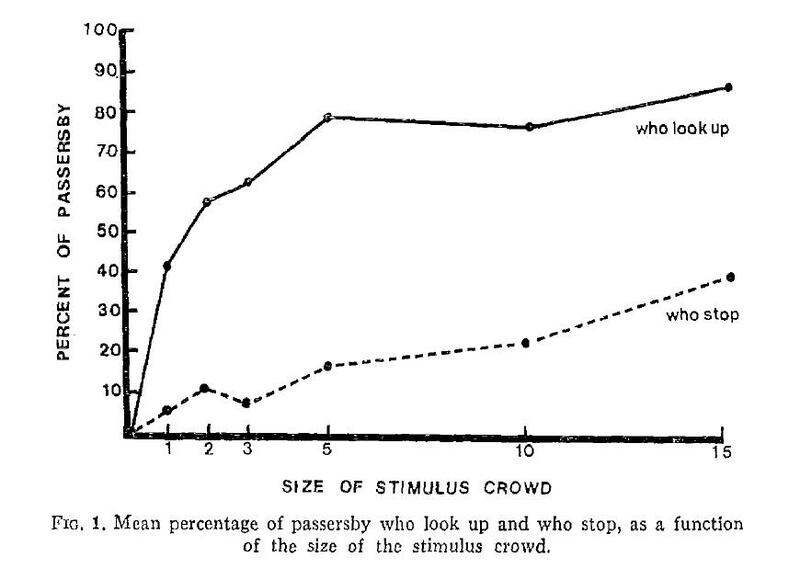 The size of the crowd who look up the sky increase as a function of the stimulus crowd. How nations mix ingredients in their food based on traditional Persian medicine. January 2010, I was in Berlin with a good Turkish friend. She is vegetarian. At some point she expressed her stomachache. I turned to her and said “of course you have stomach ache because you ate this and that together”. She looked at me strange that what I am talking about! That was a shock to me. The ingredients mixing knowledge that back in Iran sounds completely obvious to everyone, is not that obvious even in Turkey! I started explaining her the rules on how to combine foods and my friend was amazed. Then after, I tried to observe how other nations combine food and how the knowledge of food mixing is widespread. In 2011 I met Yong Yeol Ahn in a conference. He was researching on the networks of food pairing in various cuisines. Gratefully, he shared the dataset of recipes with me. 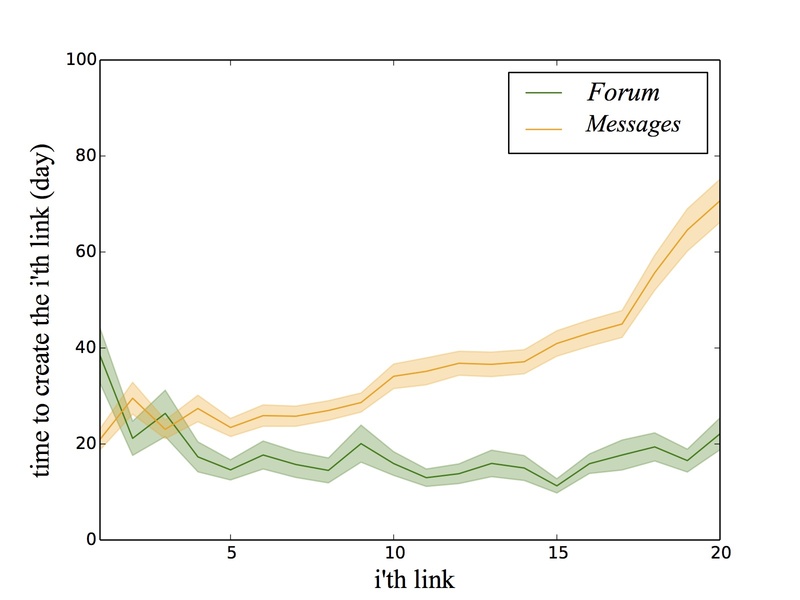 Gradually, as a small side project, I started looking at some aspects of that data. Let me first start with sharing with you a background of the tradition knowledge of ingredient mixing. Traditional Persian medicine developed by Avicenna (981-1037). Avicenna in his well-known book, The canon of Medicine, integrated and studied the principle of various medicine such as Greeks, Europeans, East Indians, Persians, Arabs, Chinese and Tibetans. In this book, he aggregated variety of methods and makes them into one standard principle of medicine. Avicenna methodology is based on the ancient theory of four temperaments, known as Unani medicine (Tibb). In the Unani medicine there is not a single cause for disease, rather a result of disorder in the body metabolism. For Avicenna and his contemporary followers, there is no such thing as a ‘single’ cause of disease; rather an outcome of various factors, such as the food and body metabolism. Avicenna believed most illnesses arise solely from long-continued errors of diet and regimen. Based on Unani system, foods are said to be either ‘hot’ (garmi) or ‘cool’ (sardi). This classification is consistent with other systems that seek to obtain an overview of the metabolic process, such as the East Indian Ayurvedic medicine and traditionsl chinese medicine. In this post, I do not intend to discuss how this medicine developed and spread out over the world. Rather, I want to take a look on how other nations mix their food ingredients based on traditional Persian food culture. Persian cuisines adapted the Unani system in the way of combining different ingredients. In Persian culture, foods are categorized into two big categories, hot and cold. As a rule of thumb, basic components of a food are metabolically hot. Cool ingredients are added seasonally such that the whole cuisine has good hot-cold balance. Here is the hot-cold list of ingredients that I collected from different Iranian sources. I tried to keep it reliable but also considering crowd wisdom. Therefore it might not be completely accurate. When I was browsing through different Iranian websites, I noticed some of categorizations are contradictory. I tried to check more than two or three sources to make sure that the categorization is reliable. hot (garmi) ingredient list: scallion, pea, roasted_pea, soybean, radish, sesame_oil, nutmeg, walnut peanut, peanut_butter, fenugreek, caraway, cayenne, basil, vanilla, parsley, bell_pepper, green_bell_pepper, chickpea, leek, broccoli, peanut, berry, carrot, ginger, red_bean, nutshell, coconut, kakao, cabbage, honey, dates, sesame, mango, morus, banana, peach, orange, eggplant, potato, mushroom, shiitake, savory, mint, saffron, pepper, grape, green_bean, pistachio, wheat, pasta, noodle, bread, egg, cumin, almond, coconut, hazelnut, celery, shrimp, camel_meet, liver, butter, lamb, chicken_broth, bird, chickpea, cilantro, cinnamon, raisin, lobster, sesame_seed, cayenne, marjoram, oat, tarragon, thyme, cauliflower, fennel, oregano, lavage, nutmeg. cold (sardi) ingredient list: citrus, oyster, cheese, jerusalem_artichoke, bitter_orange, snap_bean, green_bean, cod, cilantro, starch, pork, tomato, vinegar, coriander, genus, watermelon, cucumber, pumpkin, Pomegranate, cheese, watermelon, pear, apricot, okra, spinach, corn, grain, rhubarb, squash, lime, lettuce, rice, lentil, strawberry, dill, coriander, yogurt, milk, fish, veal, apricot, rabbit, goat, beef_broth, roasted_beef, margarine, butter_milk, celery, sprouts, zucchini, spinach, cabbage, okra, cauliflower, broccoli, white_potato, sweet_potato, carrot, cucumber, soybean, turnip pea, lima_bean, kidney_bean, coconut, brown_rice, cilantro, rheum tuna, salmon, veal, bacon, crab, pork_sausage, catfish, tamarind, mussel. 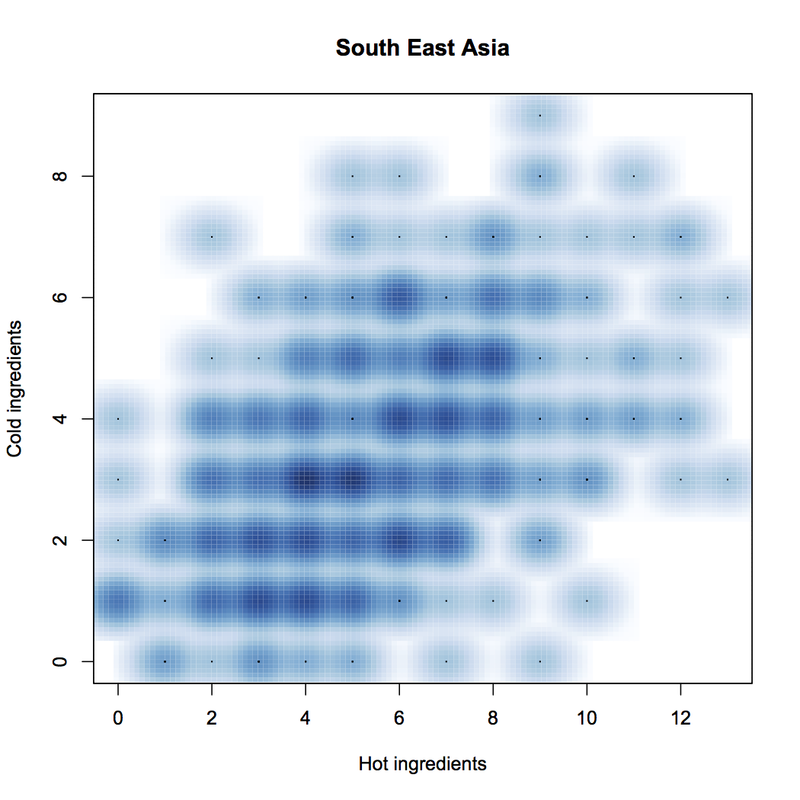 For various geographical regions I plotted number of hot and cold ingredients per recipes. 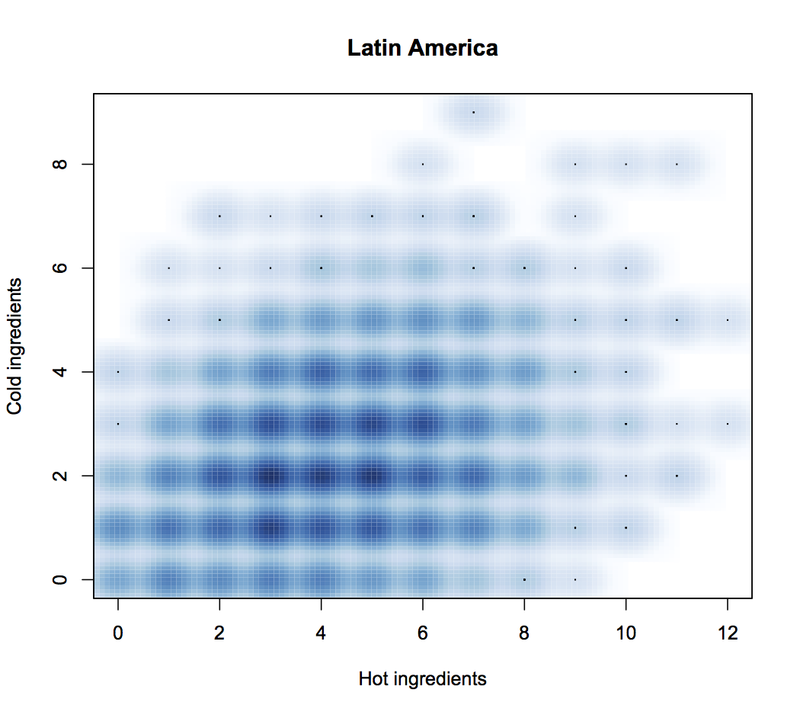 Each dot in the plots is one recipe. The darker the blue, shows more recipes are lying there. 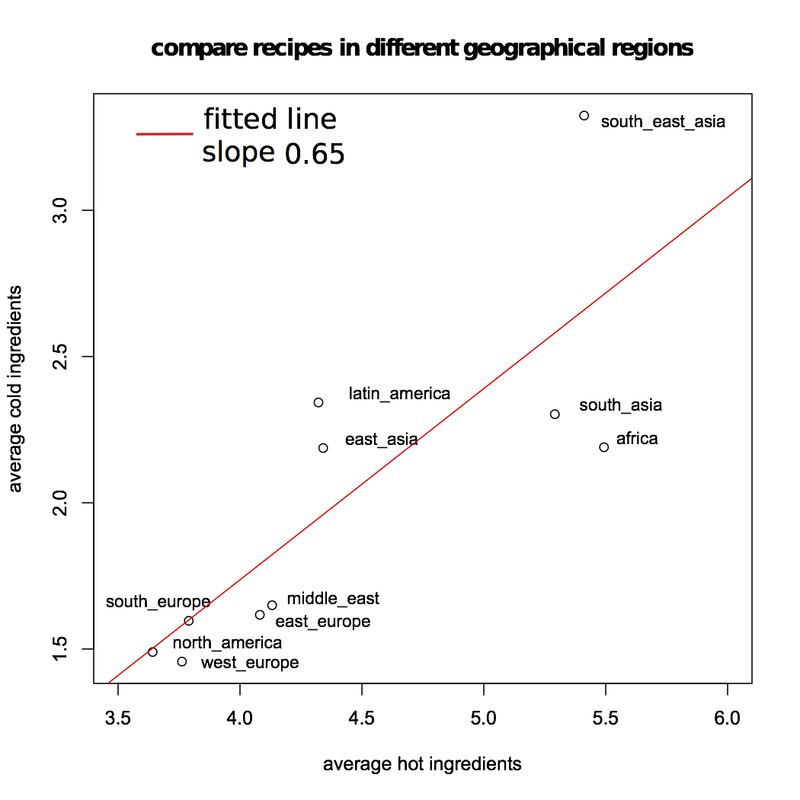 So what we have learned from this analysis; There is a difference in the number of ingredients across regions. In some regions food are simpler, consists of few amount of ingredients. That are points in the bottom left of the plot. Such regions are north America, Europe and Middle East. 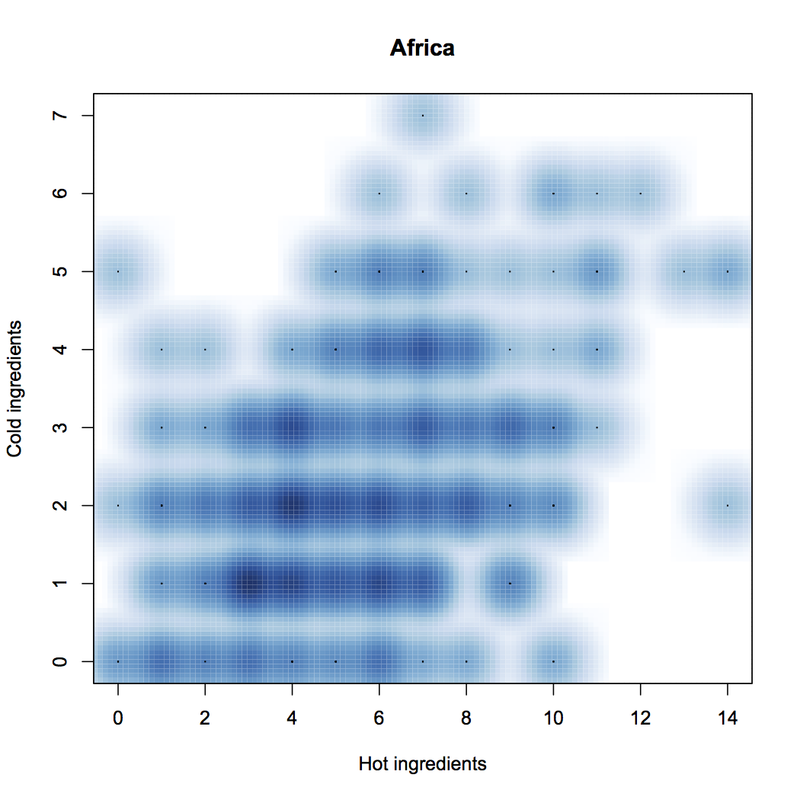 Whereas in Asian, African and Latin American cuisines number of ingredients per recipe on average is higher. 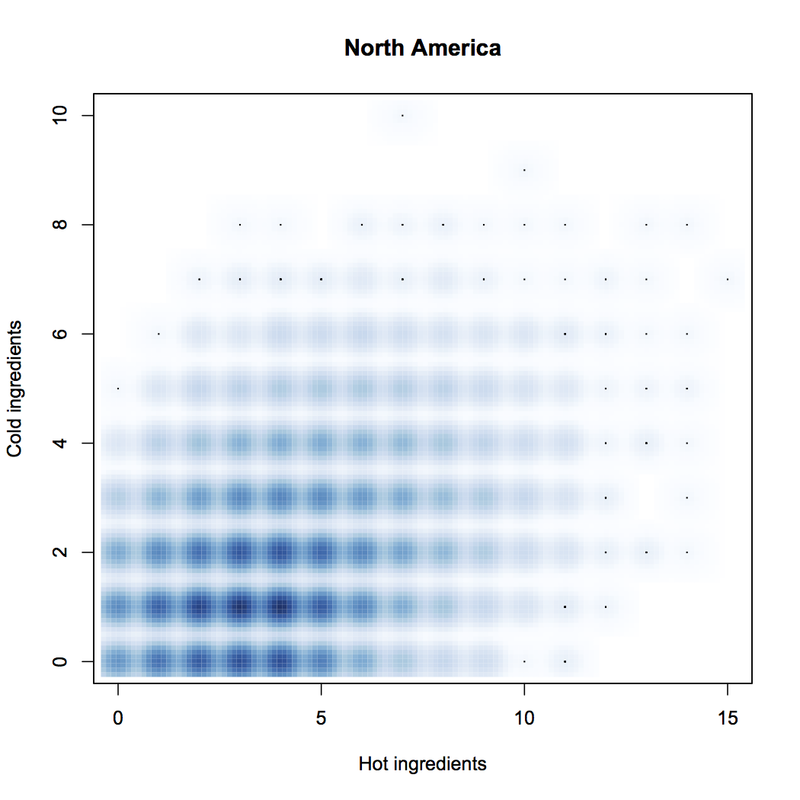 There is a relationship between number of hot ingredients versus cold ingredients. Out of 10 ingredients in one recipes, the fraction of hot to cold ingredient is approximately 6.5 to 3.5. Why is that? 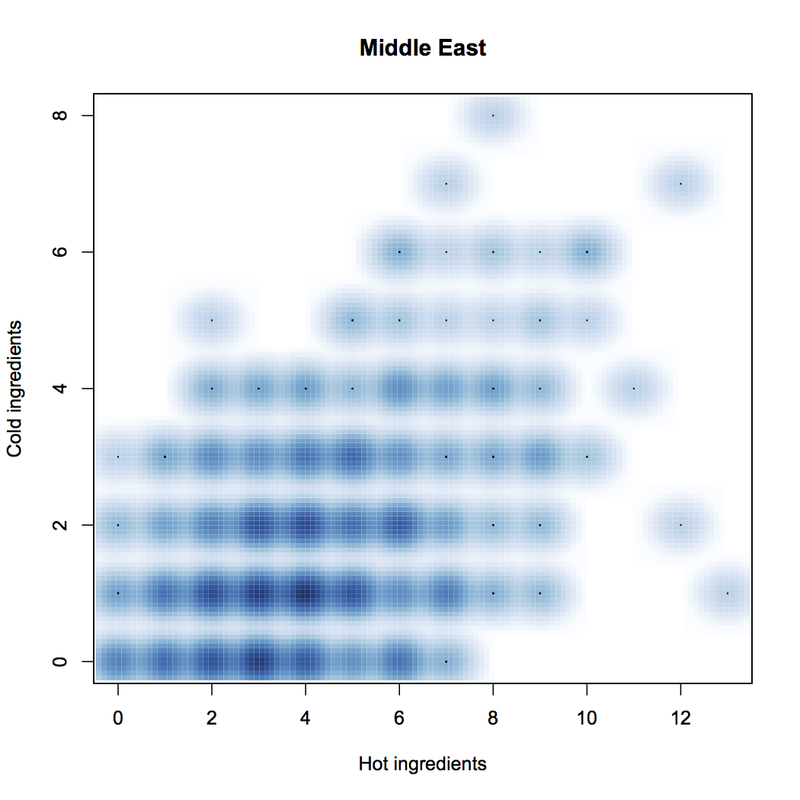 Of course there are limitations in this analysis that one needs to consider: the hot/cold categorization is based on Persian traditional food culture. Many ingredients are not listed. Many ingredients change their effect when they are cooked. Ingredients have different portion in one dish, here we ignore that. With more globalization, the culture of food is changing and maybe categorizing recipes based on geographical space is not 100% accurate. 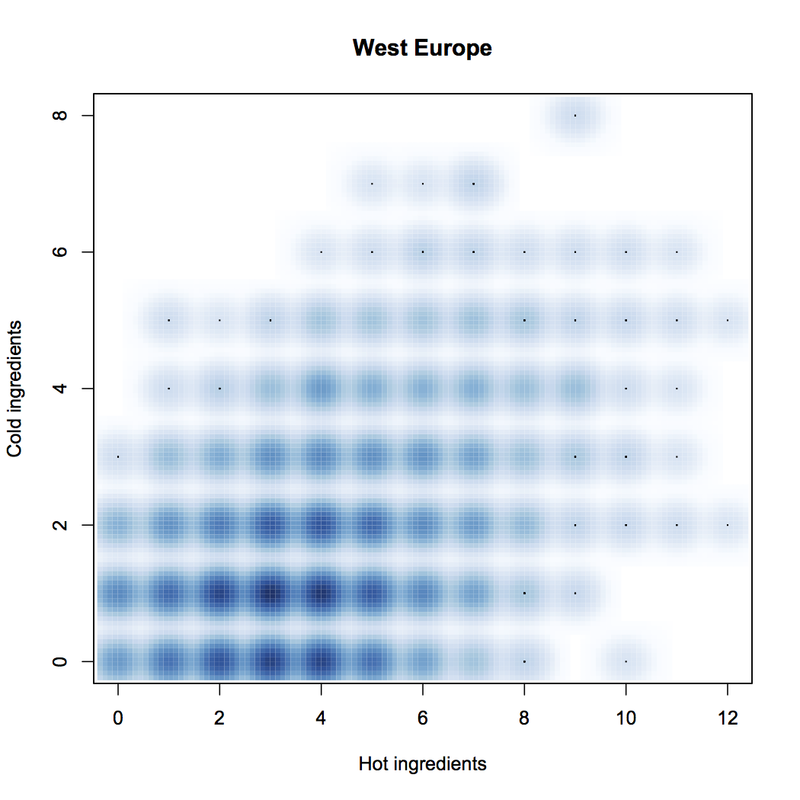 There are open questions here: What is the scientific reason behind the relationship between hot and cold ingredients? Is it related to the chemical reactions or temperature in different regions? Can this knowledge be used to diagnose some disease related to food or stomach ache? Can we use this knowledge to combine ingredients and come up with new recipes? Can we make recipes with right combination of ingredients to give us the best metabolism?